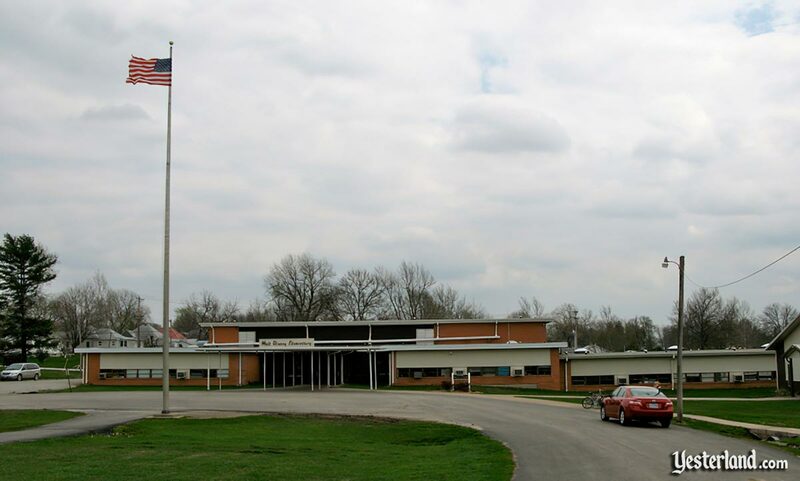 As a child, Walt Disney was a student at Park School in Marceline, Missouri. When Park School was replaced by a new elementary school in 1960, it was named after its most famous alumnus. But there was more to it than just the name. 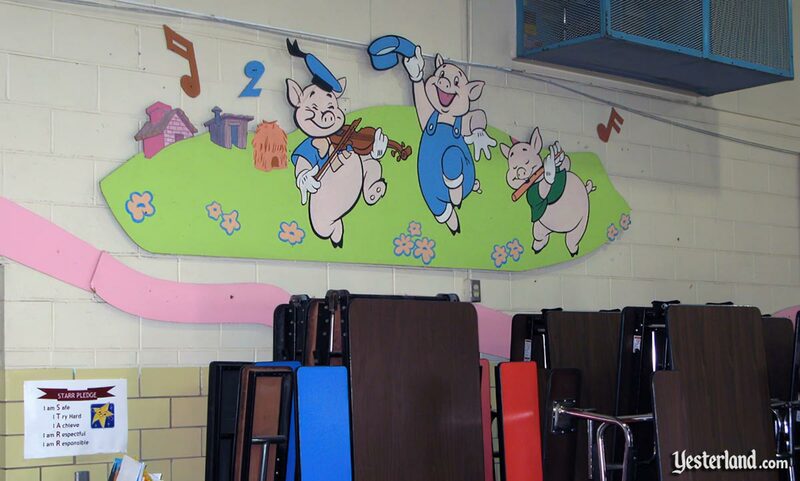 The “Magic of Learning” begins in Marceline, Missouri. 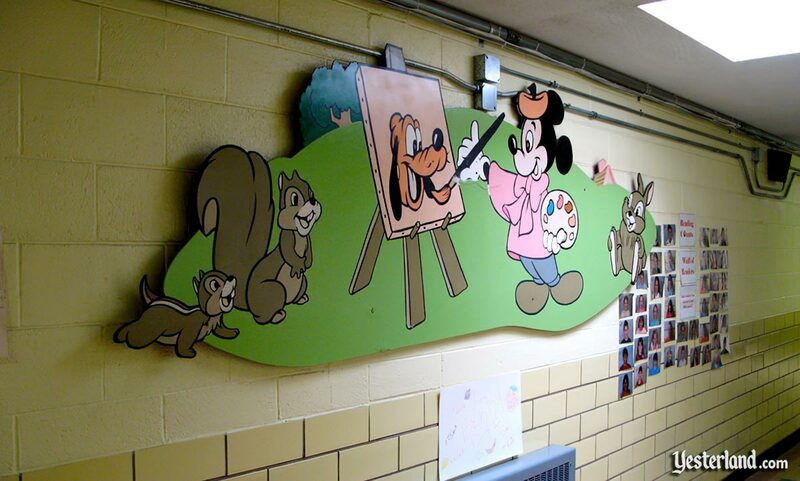 There are schools named Walt Disney Elementary School in many cities and towns—including Alvin, Texas (1979); Anaheim, California (1958); Burbank, California; Clinton Township, Michigan; Gates, New York (1967); Levittown (originally Tullytown), Pennsylvania (1954); Mishawaka, Indiana (1972); Omaha, Nebraska (1974); Rochester, New York; San Ramon, California (1974); Springfield, Missouri, and Tulsa, Oklahoma (1969)—and other cities under slightly different names, such as Walt Disney Magnet School in Chicago, Illinois. Some of these locations have significant connections to Walt Disney. After all, he was born in Chicago, built his major studio in Burbank, and created Disneyland in Anaheim. 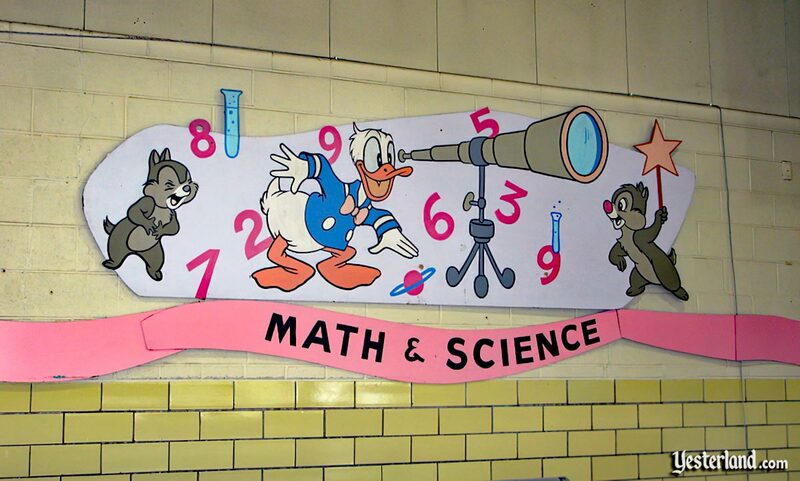 But Walt only began his own elementary education in one town: Marceline, Missouri. At age 7, Walt and his little sister Ruth were enrolled in Park Elementary School, a 2-story brick building not far from the center of town. The school is a modern, single-story structure, similar in style to many other schools of its era. Fast forward to 1960, when a new, modern school is built to replace the aging Park School. By now, of course, Walt Disney had become a world famous and beloved filmmaker whose successes include cartoon shorts, animated features, live action movies such as 20,000 Leagues Under the Sea, television programs such as Zorro, and the still relatively new Disneyland. School officials in Marceline asked Walt Disney if he would allow them to use his name for the new school. 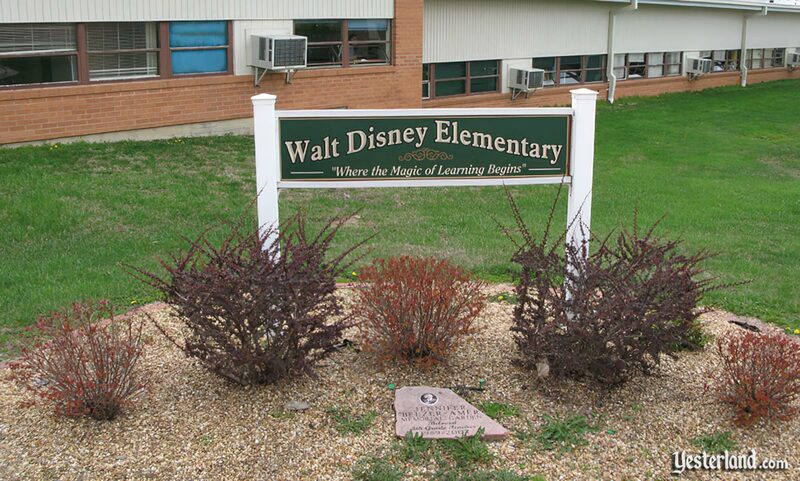 Even though this was not the first public school named after him, Walt was thrilled. He not only said yes, but also contributed educational materials, artwork, playground equipment, and even a special flagpole to the new school. The 55-foot flag pole came from the 1960 Winter Olympics at Squaw Valley, California. Walt Disney had been the Chairman of Pageantry for the 1960 Olympic Winter Games in Squaw Valley, California. At the Olympic site, 30 flagpoles flew the flags of the 30 participating nations. Each flagpole had a plaque signed by Walt Disney. 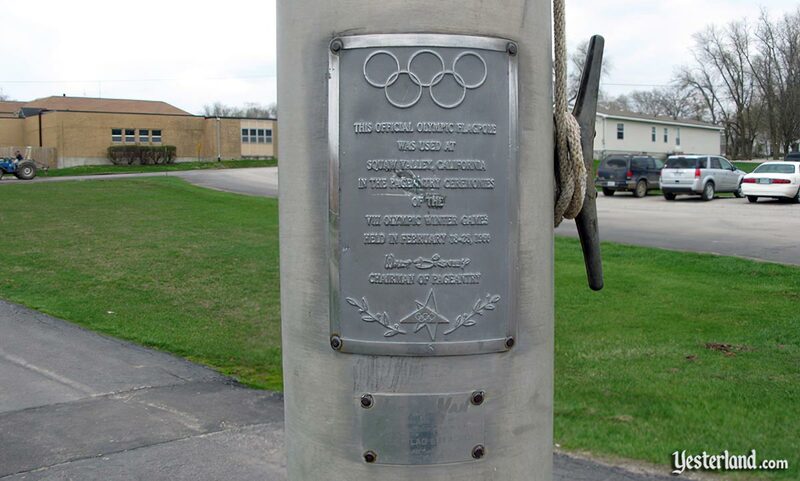 Walt arranged for one of the flagpoles to be moved to the front of the new school after the games. Its still there today, complete with the original plaque. 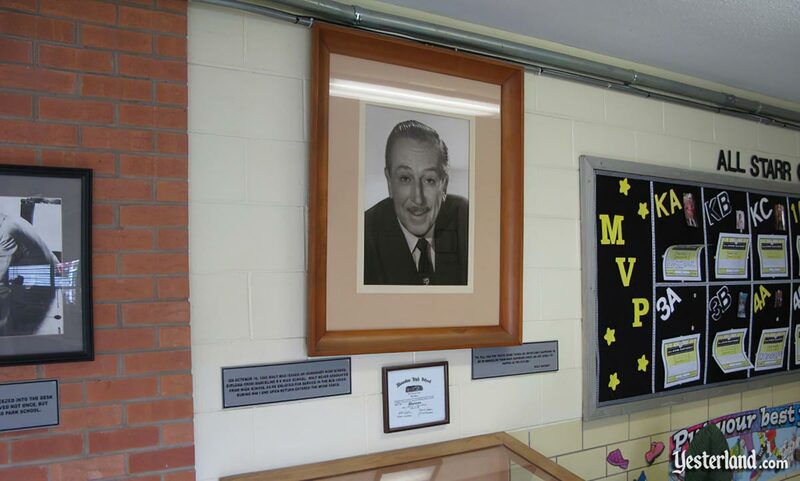 A portrait of Walt Disney hangs above a glass case that sometimes contains his school desk from a hundred years ago. 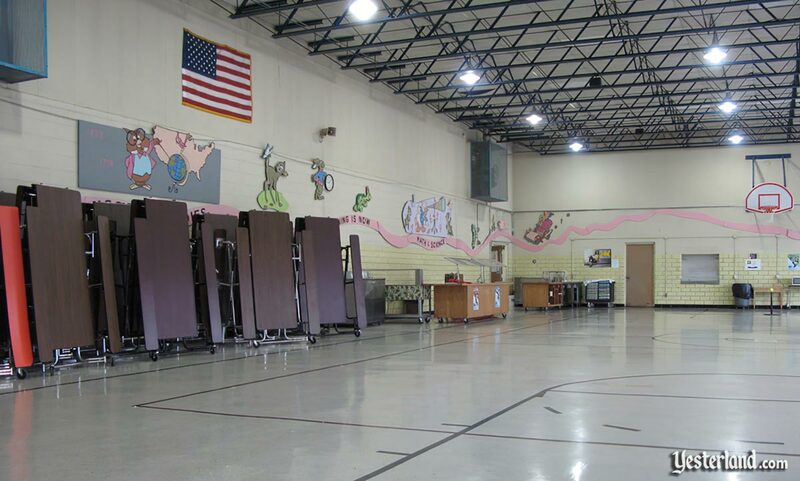 Now, 50 years after its construction, Walt Disney Elementary School is still educating the children of Marceline. Its not a place for tourists, but I was allowed to go inside the school and to take pictures. During most of the school year, a glass case in the lobby holds a school desk from the old Park School with the initials “WD” carved into the wooden top. When the Walt Disney Hometown Museum opens for its season on April 1, the desk moves to the museum. A reproduction of this desk, complete with the carved initials, is in the Walt Disney: One Mans Dream attraction at Disneys Hollywood Studios in Florida. 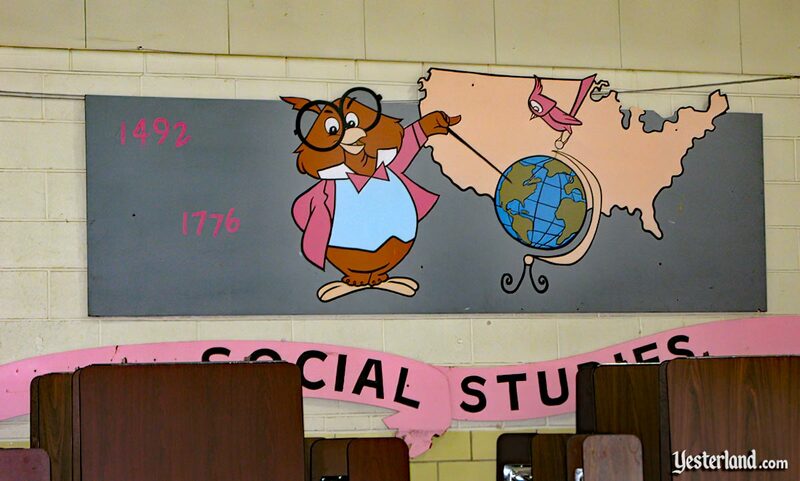 Photos in the schools entry lobby document its history. 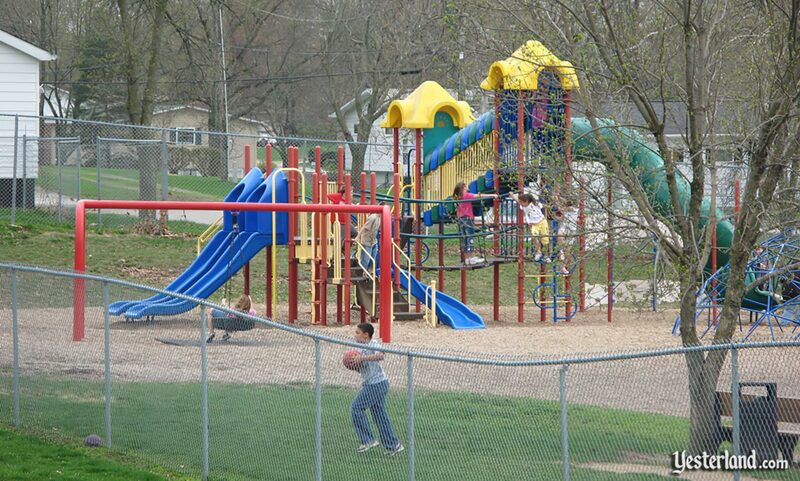 The current playground is from 1984. 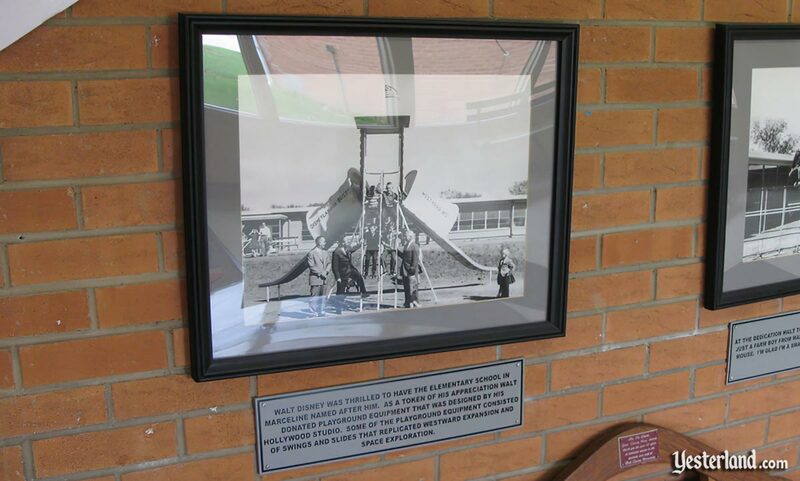 The current playground equipment was donated by Walt Disney Productions in 1984. A mural in the entry lobby, designed by Disney Legend Bob Moore, provides a preview of more to come. 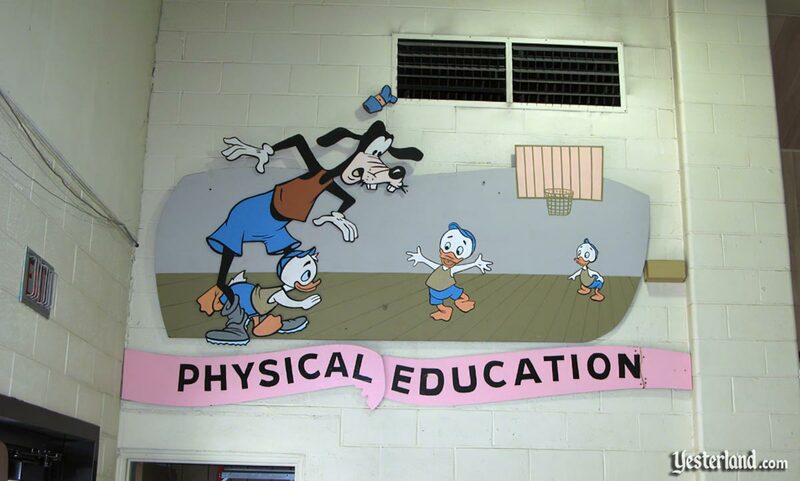 Walt Disney commissioned one of his artists, Bob Moore, to design artwork for the schools entrance, hallway, and gymnasium. The artwork, featuring dozens of Disney characters, is delightful. The characters are rendered in a clean, simple style that reflects the Disney art of the era. Another Bob Moore mural is in the hallway to the classrooms. Among the highlights of Bobs prolific career was designing the Walt Disney Commemorative U.S. postage stamp in 1968, as well as the official mascot for the 1984 Olympics—Sam the Eagle—which he incorporated into all the logos for each Olympic event. 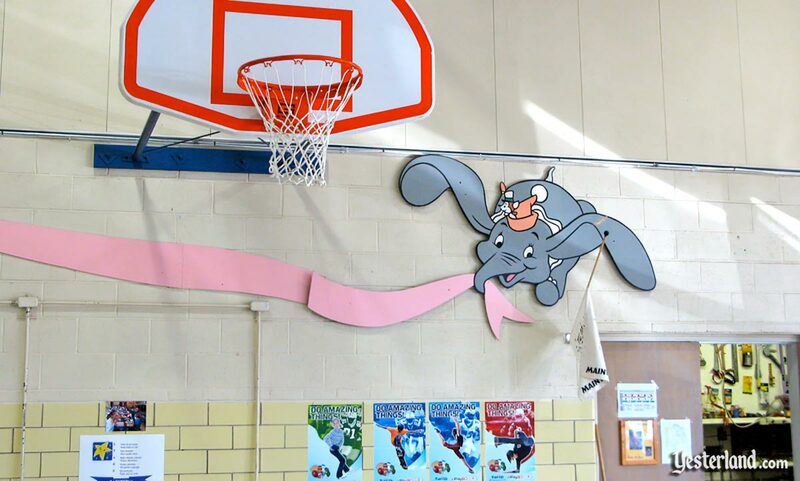 Bob also designed murals that adorn the halls of three Walt Disney Elementary Schools located in Tullytown, Pennsylvania; Marceline, Missouri; and Anaheim, California. The gym is a veritable Bob Moore art museum. The murals still look great a half century later. (They must have used good paint.) The gymnasium if one of those multi-purpose halls that serves as a gym, cafeteria, and auditorium. When I took the pictures, folded tables and lunch service equipment were along the wall. Shortly before I took the photos, children were active in Physical Education class. 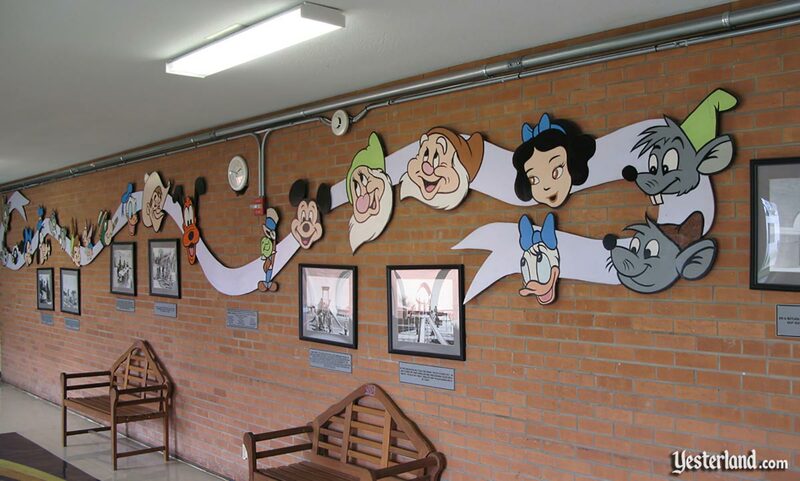 The Disney characters are still part of the Marceline childrens school experience, just as Walt Disney envisioned it 50 years ago. For the rest of this article, enjoy Bob Moores Disney artwork—and think about how Walt Disney continued to care about his childhood hometown of Marceline, five decades after his childhood there. Chip n Dale join Donald in this Mathmagic Land. 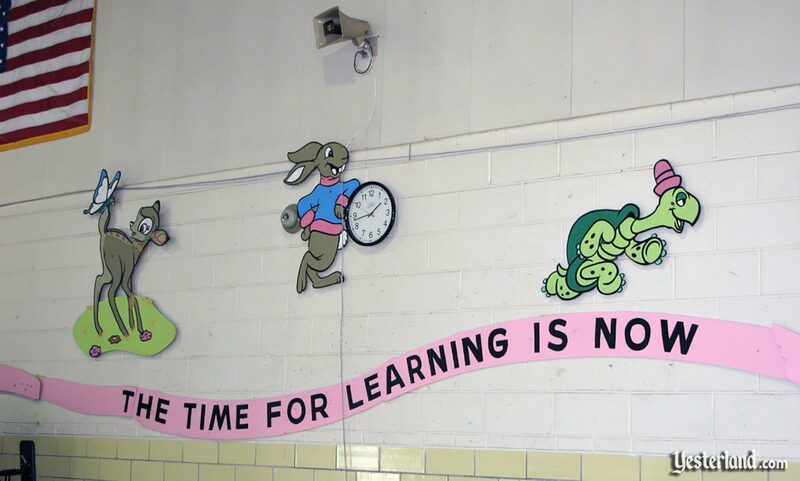 The kids at this school are too young for Driver Education. 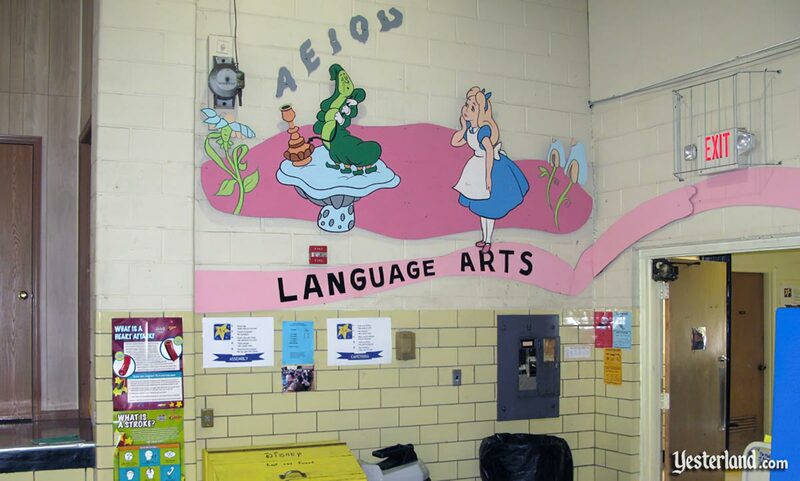 Photographs of Walt Disney Elementary School in Marceline, Missouri: April 2010 by Werner Weiss. Thank you to Kaye Malins at the Walt Disney Hometown Museum for her assistance.